I’m not sure if I could cope with having to say ‘Lingo Bingo’ for the next two months, but we’ll see. 54 people took part in the experiment. Now, there are some complications with the results, as documented in the last attempt to do this. Basically, if two people start at roughly the same time, then they start separate chains, causing Galton’s problem. However, we’ll ignore that here. There are some other problems, too. When people couldn’t remember any more words, they were asked to make something up. Some people made variations of existing names e.g. Language Detective -> langua-detecive, lingua-detective. Others made new names, e.g. “Ling to go”. But many just gave up, resulting in names like “can’t remember anymore”, “another guess”, “…” and “ah fuck_sorry”. Who Wants to Match Two Languages? But is there evidence of evolution? 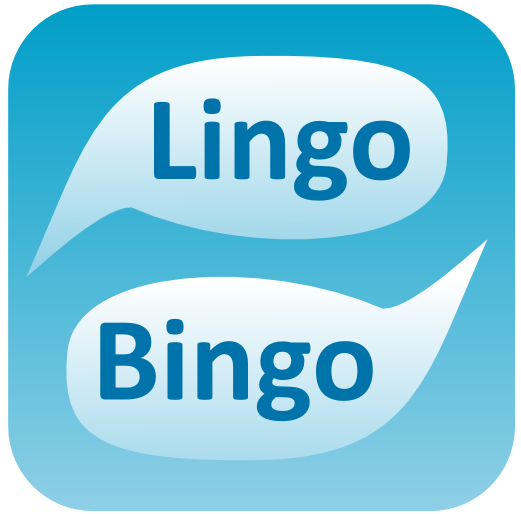 Well, to start with, “Lingo Bingo” is was replicated many more times than its closest rival. 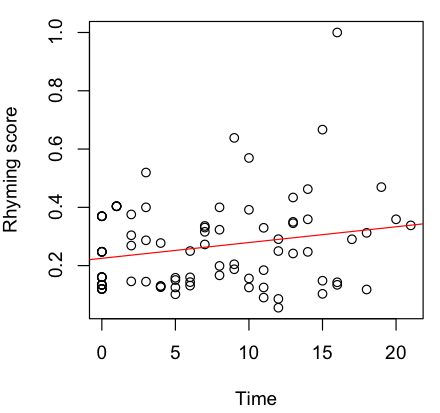 Also, the average length of names dropped over time (r = 0.32, p = 0.006), which makes sense – shorter names are easier to remember. 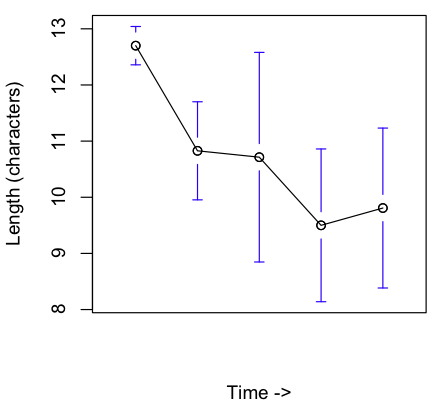 Interestingly, there was also some evidence of systematicity emerging. There were many cases of words being swapped. Also, some of the original names had rhymes, like “Lingo Bingo”. The rhymes were replicated in new names, e.g. “Slango Whango”, “Babel Fable” and “Language Panguage”.